Learn more about what you can get inside the Brawl Stars' Shop. From Daily Deals, Starter Packs, Key Doublers, Boxes, and Gems, these can make your Brawl Stars experience even more fun! The Brawl Stars’ Shop gives players additional in-game power-ups and in-game currency bundles to hasten your brawler’s powers. Players can additionally increase the amount of in-game currency they have at their disposal. Items for sale include Power Points, Token Doublers, Boxes, Gem Packs, and Coin Packs. A number of one-time specials are available regularly as well, unlocking as the player levels up. Level packs are bundled goodies that are purchasable with real money upon reaching a certain player level in the game. The items in the Level Pack range from Brawl Boxes, gems, coins and even Token Doublers. The items offered in the Level Pack change after the time indicated in the panel ends. The Daily Deals section gives players the option to purchase Power Points for their Brawlers. These Power Points are important, as they are how Brawlers level up and grow in stats. Power Points are purchased via Coins which you get in Brawl Boxes. 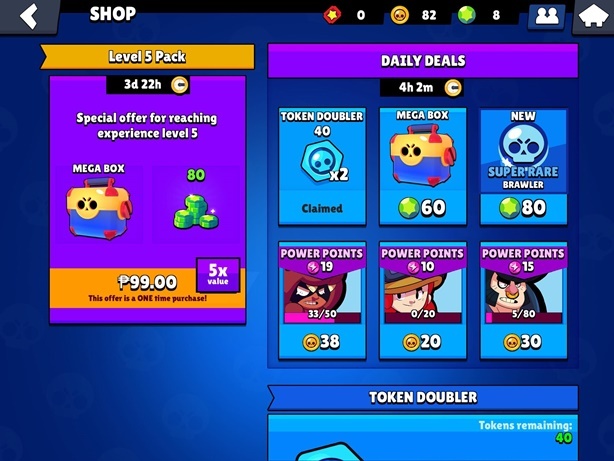 Players will occasionally receive offers to purchase skins or Brawlers on occasion as well. Speaking of Boxes, the Brawl Stars Shop gives players a Free Box or Token Doubler daily. This Free Box can be claimed at any time and refreshes once per day. It is a nice way to boost up your gold and power point totals, even at times when playing may be difficult. As the name suggests, purchasing the Token Doubler increases the number of Tokens you win in any game mode.. This is particularly useful when you want to grind for Boxes. Token Doublers can be bought using Gems. Boxes contain various goodies for players, ranging from Coins, Power Points, Brawlers, and even Gems. Players can buy either a Big Box which costs 30 Gems, or a Mega Box which costs 80 Gems. The bigger the Box you purchase, the more items it contains. The Brawl Stars Store also has various Gem Pack bundles for players. These bundles range from 30 to 1850 Gems and can be bought with real-life currency. Lastly, Coin Packs give players Coins, with which they can purchase Power Points and upgrade their Brawlers. Coin Packs range from 150 to 1200 and can be bought via Gems. You can learn more about the different types of currencies used to purchase shop items in our Currency Guide.